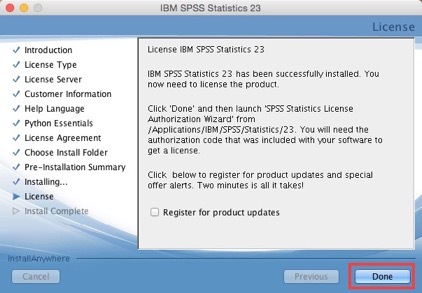 Please review the hardware/software system requirements before downloading to ensure your computer is compatible with IBM SPSS 23. 1. 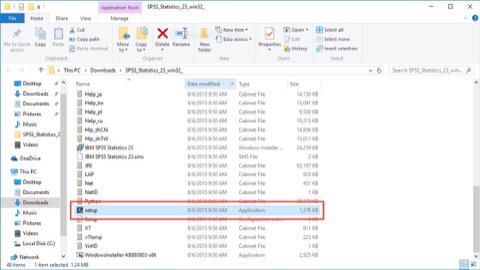 Navigate to the downloads folder of your PC. 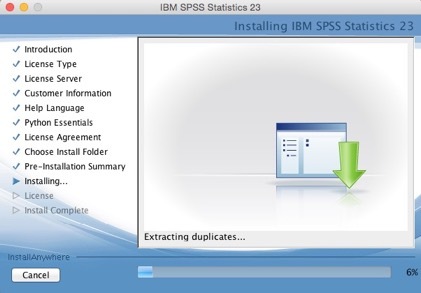 There you will find the .zip file of the SPSS v23 install. This needs to be decompressed to preform the install. 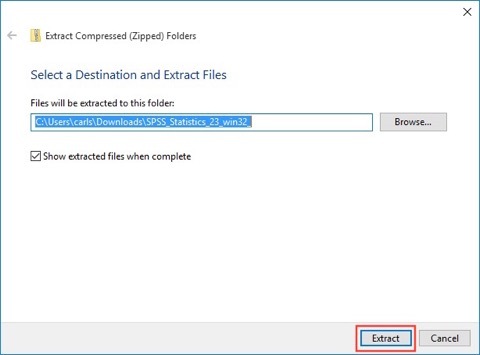 To do so right click on the .zip file and use the "Extract All..." command. When the extract window comes up use defaults and click the "Extract" button. 2. 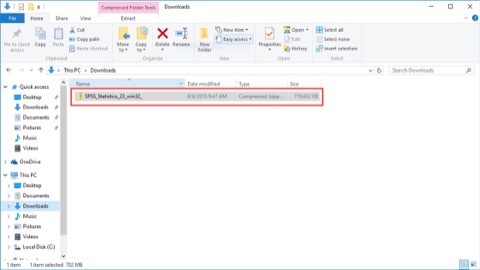 With the files now extracted open the folder (if it did not auto open after extraction), and run the found in the folder setup.exe. 3. 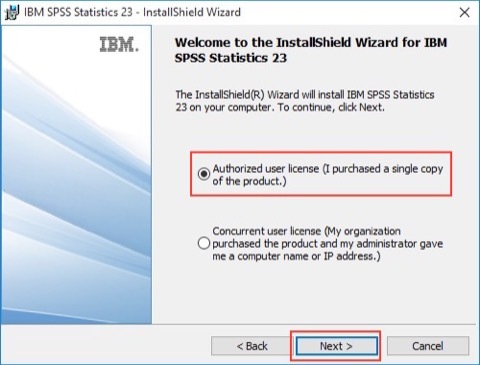 Follow the on screen prompts of the SPSS v23 InstallShield Wizard to advance to the next step. 4. 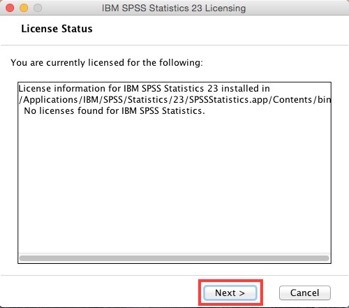 Select the Authorized user license path, and click "Next". 5. 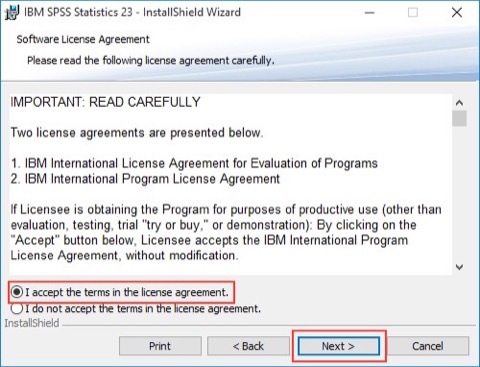 Accept the terms of the install, and click "Next". 6. Input your name and organization "Palo Alto University". After that is done click "Next". 7. If you require extra languages select them now. 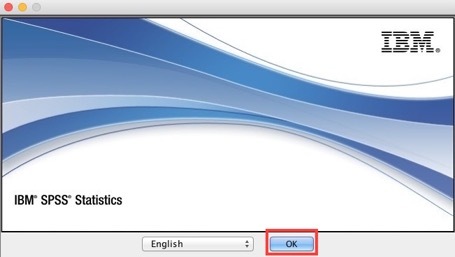 If not proceed by clicking "Next". 8. Follow defaults for the opt-in packages. 10. 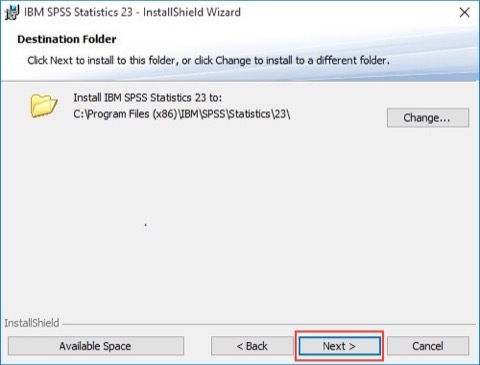 Use the default install location, and click next. 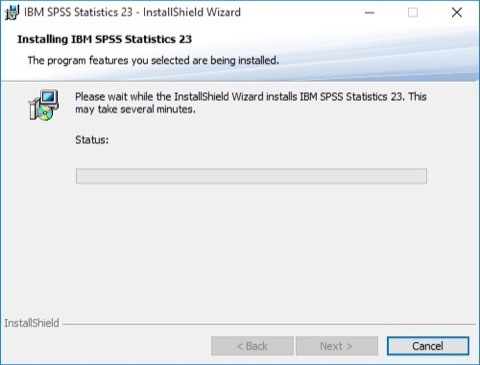 Start the install, and wait for it to complete. 11. 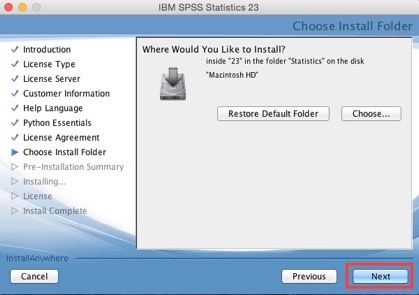 Opt out of update e-mails from IBM and then close the installer. 12. 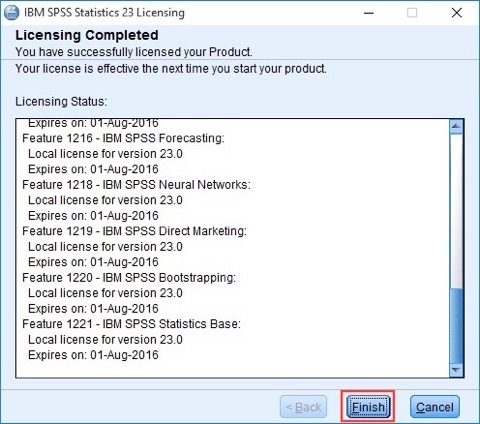 The licensing app will auto launch after the install. 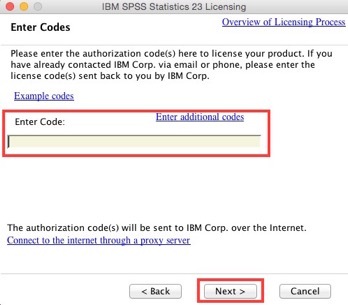 Select the "License my product now" option, and then enter the code from the download webpage used earlier. Then click next to move on. 13. 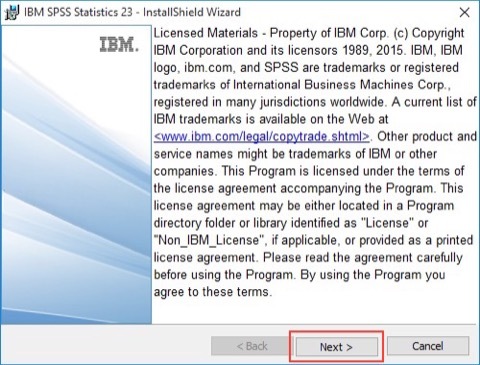 After your code has been entered, and you have clicked "Next" the installer will contact IBM and activate the program. 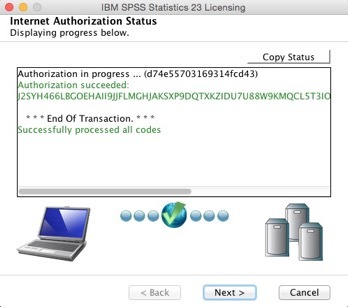 If this is successful you should receive a message saying that the authorization has succeeded. 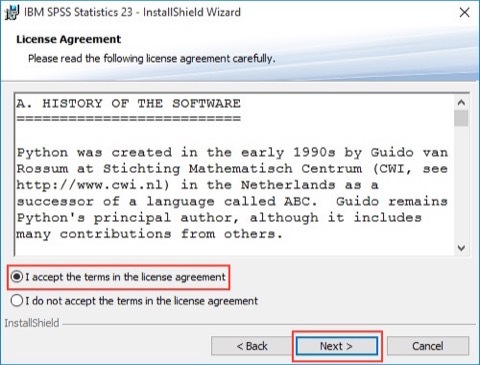 After the authorization has finished the installer will display information about your software, and it's expiration date. Once you have reviewed this you may click "Finish". Your PC may require a restart after the install. If it does please do so. 1. 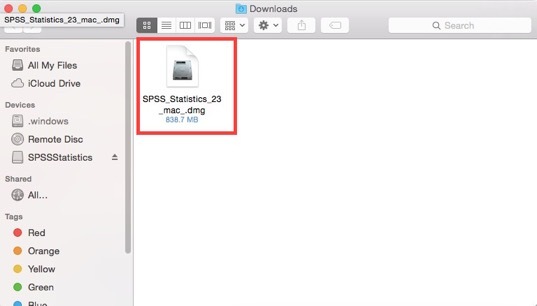 Navigate to your downloads folder. 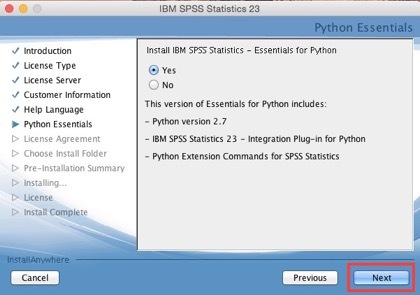 There you will find the .dmg file of the SPSS v23 install. 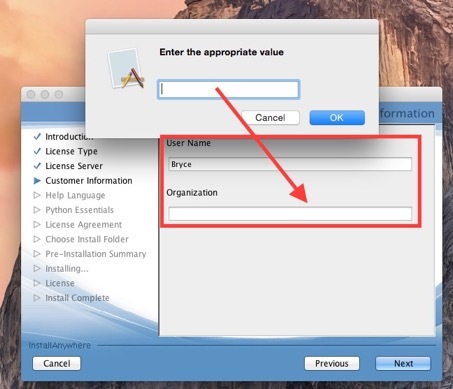 Open the DMG, and then once the DMG is open run the Installer app. 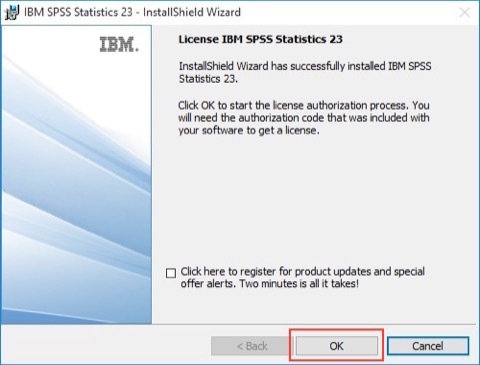 The app will verify and then prompt if you want to open it. 2. 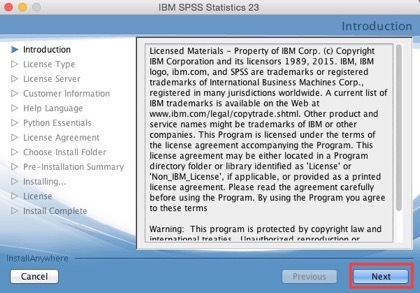 If the installer does not open (if it did move to the next step) navigate to System Preferences, and the "Security & Privacy" preference pane. 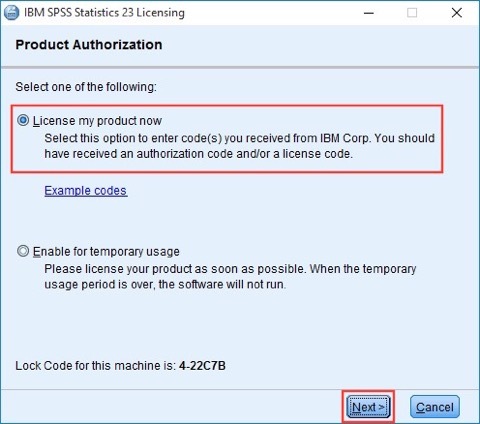 There you will need to adjust the gatekeeper settings to allow from anywhere. To do this click the lock in the lower left of the window and input your Mac password if the Mac asks. 3. 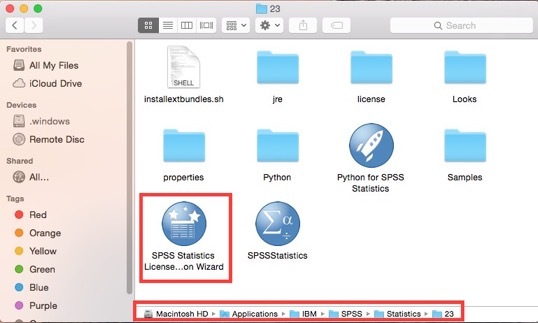 If you are using a Mac running MAC OS X 10.7 or higher, and you have not previously used the Java SE 6 Runtime your MAC will prompt you to install this for SPSS. 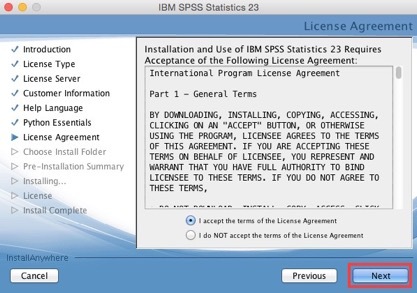 If the runtime was already installed skip to step 6. 4. 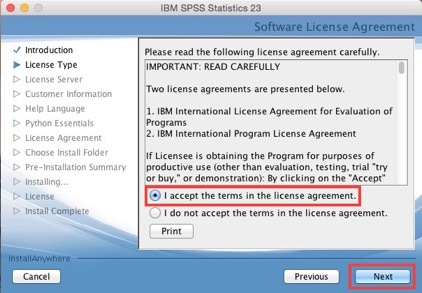 Agree to Apple's SLA. 5. Wait for the install to complete. 6. 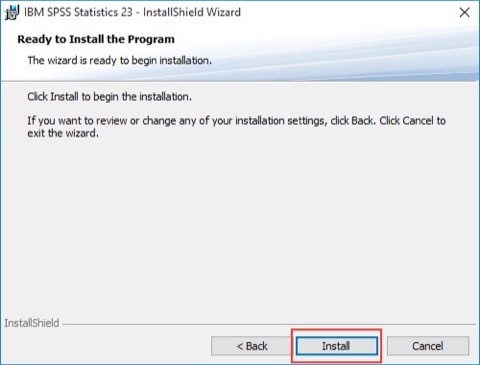 Click "OK" and then "Next" to get the install set up started. 7. 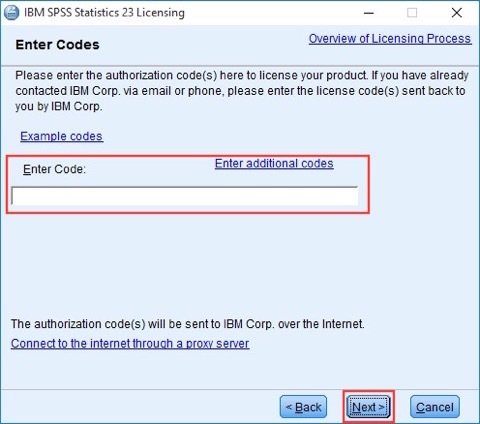 Select the Authorized user license path. 8. 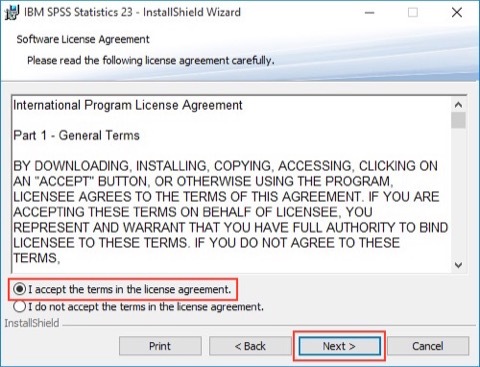 Accept the terms of the install. 9. Input your name and organization "Palo Alto University". After that is done click next. 10. 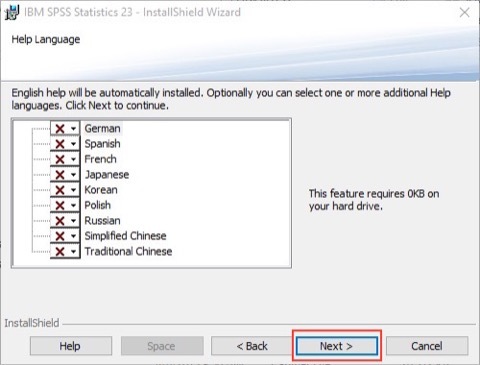 If you require extra languages select them now. 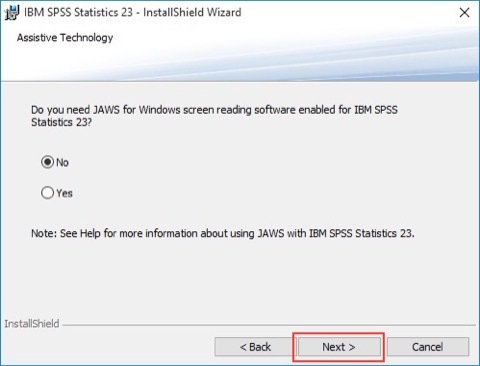 If not proceed by clicking next. 11. Follow defaults for the opt-in packages. 13. 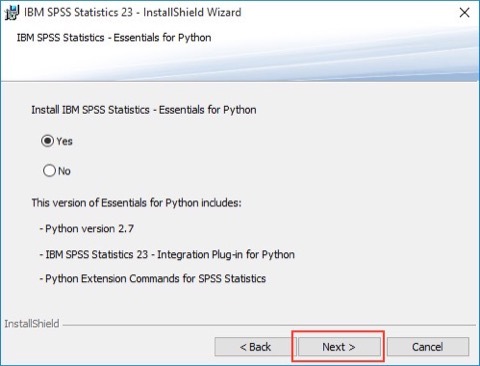 Use the default install location, and click next. 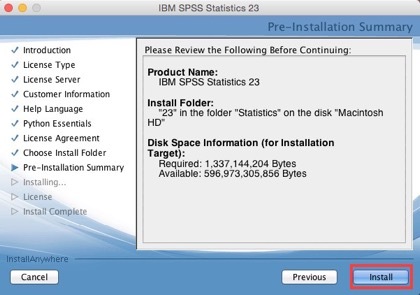 Start the install, and wait for it to complete. 14. 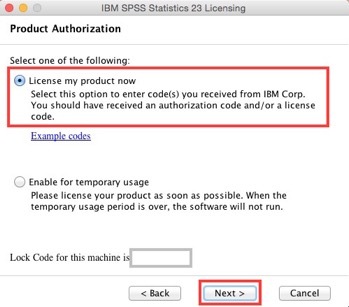 Opt out of product update e-mails. 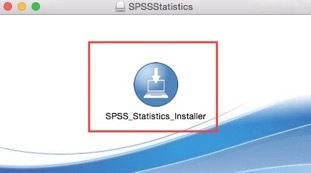 Close the installer. 15. 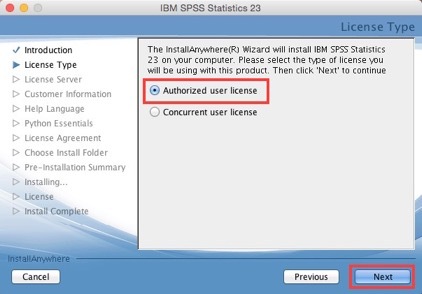 Navigate to the License Authorization Wizard that can be found under Applications > IBM > SPSS > Statistics > 23 then open the app. 16. 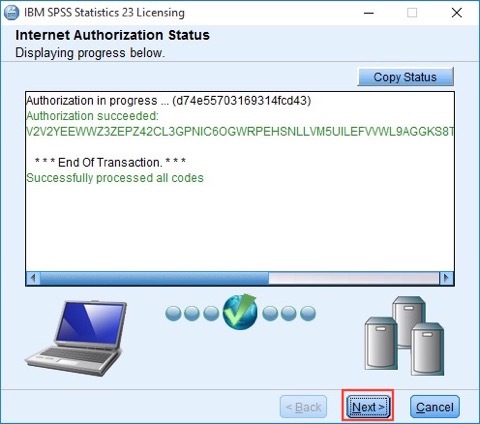 Click next to start the authorization process. 17. 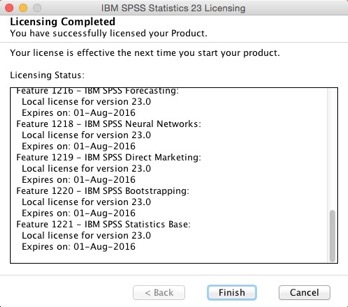 Select "License my product now" and then click "Next". Enter your license code provided for the software, and click "Next". (Note: Please make sure that the computer is connected to the internet before you click next it will be needed to active the software).